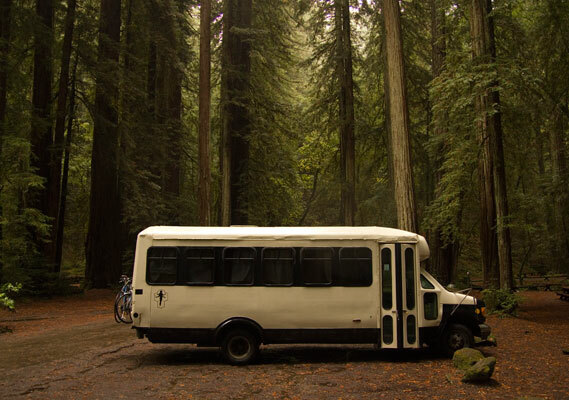 I just returned from a trip around California in a friend’s converted airport shuttle bus. After the State announced they’d be closing 70 parks to save a paltry 22 million per year, my boyfriend Jarratt, our college roommate and I took to documenting the process. 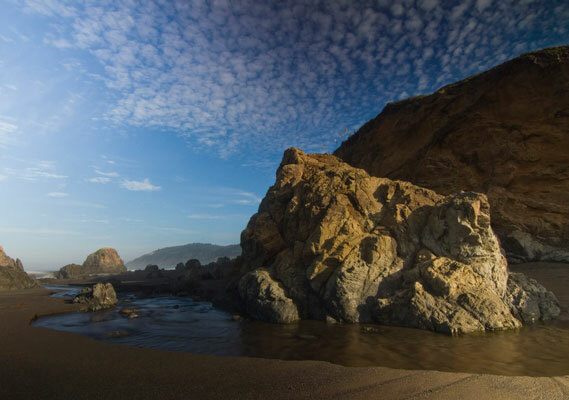 We’ve since visited just about every state park doomed for closure. The trip took us as far south as Los Angeles, and as far north as Mt. Shasta. We covered almost the entirety of highway 1, and a pretty significant portion of the 5. 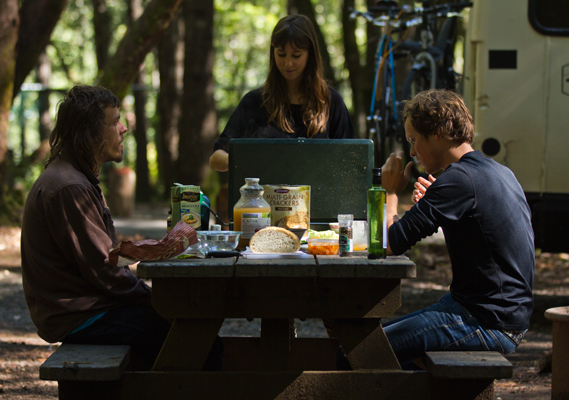 Our travels spanned over six weeks and almost every meal was cooked on our two burner propane camp stove. Before embarking on this journey, I had some reservations about being gluten free on the road. I knew from experience that gluten free camping, even backpacking doesn’t take much more forethought then gluten free cooking at home, but wanted some ideas, this wasn’t just a weekend out of the kitchen. I expected the blog world would host a wealth of knowledge on the topic: snack options, quick one pot meals, suggestions of fresh foods in need of little refrigeration. With the exception of a few articles and posts, I was left up to my own devices. 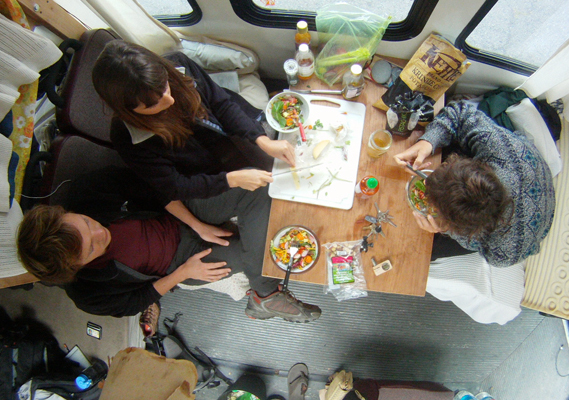 When living on an RV, every inch of extra space is of monumental importance. Our cold food storage was limited to one cooler and a glorified lunch box. 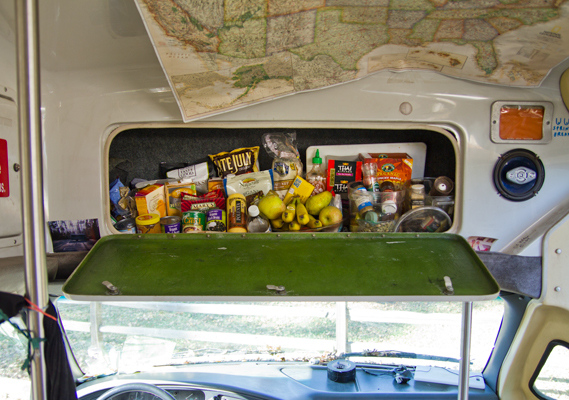 A narrow compartment above the driver acted as our pantry. We couldn’t expect to go more then about 4 days without a trip to the grocery unless we wanted to eat solely canned food, and that wasn’t happening. Rolling out of the bottom bunk every morning to fix breakfast ended up being pretty simple. I cooked several batches of granola before we embarked and baked a loaf of banana bread which stayed fresh for days. Once the supply of granola ran out, we boiled water and made oatmeal or ate rice cakes with peanut butter and sliced fruit. During lunchtime we’d either be 3 miles into a day-hike or in the midst of a long winding drive. Since gluten free sandwich bread must be toasted (unless it’s super fresh), sandwiches were mostly out of the question. Good gluten free wraps don’t really exist, and corn tortillas unheated don’t really work either. So, lunch was usually a hodgepodge of snacks with the exception of some tasty salads when time or energy allowed. Settled into a campsite or parked curbside by around 6:00pm every night, dinners would be pretty elaborate considering our means. Green curry simmered with vegetables and vermicelli noodles, quinoa and garbanzo beans with stewed tomatoes, fried plantains with black beans, polenta and guacamole, fajitas, kale soup. It wasn’t as difficult as I thought to prep, cook, and then clean dishes without a sink, a counter, or a true stovetop. Each meal brings back a memory of a special place, a long day spent hiking, or a gorgeous sunset. In fact, the normally mundane act of chopping carrots and peeling garlic became an anticipated nightly ritual when overlooking some of the most stunning scenery in America. Combine all salad ingredients. In a small bowl, whisk salad dressing together until combined. Add dressing to salad, mix until all ingredients are coated and top with a handful of Bhuja cracker mix! Add a couple drops of sriracha on top for extra spice. I love this post so so so much. So proud of you sissy! Love seeing the pictures of how you made it happen. the salad recipe sounds yummy. Lunch always seems to be a challenge, but with cooler weather coming on, soup is a nice option. What’s in the kale soup? Not easy prepping all of that in tight quarters. Love what you all are doing! Proud of you too! Great post!! About to embark on a road trip with a two year old and husband. We are all allergic to gluten and i am worrying about food prep etc. Thanks for the tips!